We had great fun when we went to ComicCon in September last year and enjoyed seeing everyone participating in cosplay and getting into the swing of it. We did our best to join in – I had a dress with stars on it (and a TARDIS) to lend a sci-fi theme to my costume, and I also wore my old wedding tiara to stand in for a crown, as is featured on the cover of book two in the Verindon trilogy, The Crown, which you can see here. However, my tiara nearly didn’t make it home in one piece! Because I’d prefer not to risk it again, I thought I’d look around and see what’s available. It turns out, there is more than I was expecting! This means I’m having trouble deciding. If you have read the Verindon trilogy, did you think the crown in it looked similar to the one on the cover or did something completely different spring to mind? 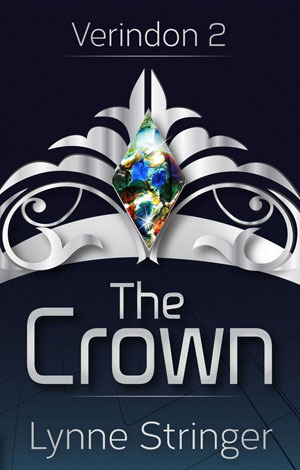 If you haven’t read the trilogy and you think of a crown that would be full of colour and included precious stones like opals but with more intense colour, what would you think of? I’m putting some links in. Tell me which number you like one, two, three, four, five or six. These are the finalists among what I’ve managed to find. If you know of something better, let me know. If not, can you tell me which of these you prefer? Double points if you can find me a colourful regal dress as well. They all have good points, but I think I like two best if you’re looking for something regal, one if you want something regal but a bit more understated. Hoping to make it to Supanova this year. Okay there’s one vote for number two. Anyone agree or disagree? We did have a fantastic time at Oz Comic Con. Looking forward to Gold Coast Supernova. Glad your wedding tiara did survive, Lynne. My preference is 1 – loved how the blue stones stand out – TARDIS blue & matches your eyes too. Though opals might work for Verindon – with a rainbow sky. Still, you have to go with what you can find to best fit your purpose. And another vote for one! I like 2 and 5 – as Nola said, more regal. (Although the simpleness of 1 is quite attractive as well…) Hmm…not very decisive, am I. Definitely not 4 – bit over the top for my liking.. So another vote for two and the first vote for five. Yes, but I thought you favoured two.